South Korean President Moon Jae In ordered the military to demonstrate an "overwhelming" show of force against North Korea's latest missile provocation yesterday, amid rising calls at home for him to harden his stance against the North. Hours after Pyongyang fired a missile that flew over Japan yesterday, South Korea sent four F-15 fighter jets out in a live-bombing drill in the eastern city of Taebaek at 9.20am local time. Officials said the exercise shows that the South can wipe out the North Korean leadership in the event of an attack by the North. Rare footage of the South's testing of a 500km-range ballistic missile with improved warhead power, and another with a range of 800km, was released yesterday by the Agency for Defence Development. These are core parts of South Korea's Kill Chain pre-emptive strike system, capable of striking "any place in North Korea if necessary", it said. Seoul also issued a strong warning to Pyongyang, vowing a firm response if provocations continue. Mr Moon, a liberal leader elected in May, has pushed for dialogue with the North even as he has sought to exert pressure on the regime to end its nuclear programme and return to the negotiating table. But he has come under growing pressure to be tougher on Pyongyang, and has been accused of downplaying the North's previous provocations, including three failed missiles last Saturday in protest against US-South Korea military drills that end tomorrow. 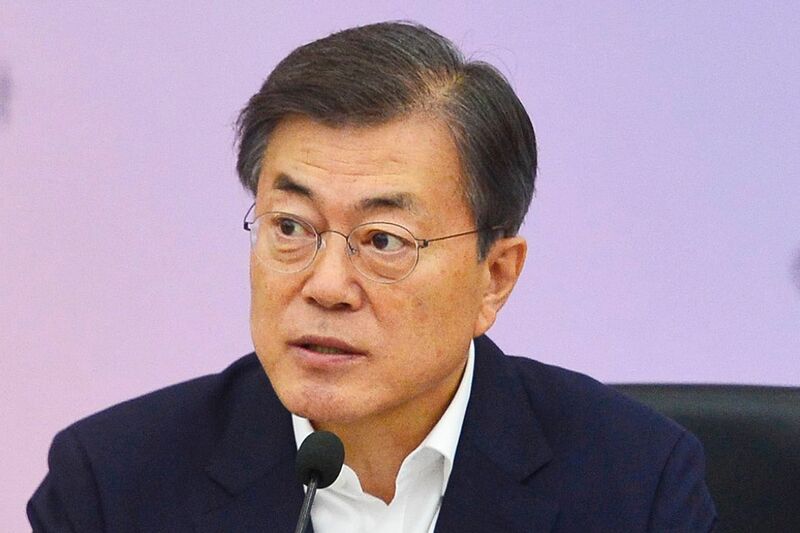 Mr Moon (above), a liberal leader elected in May, has pushed for dialogue with the North even as he has sought to exert pressure on the regime to end its nuclear programme and return to the negotiating table. But he has come under growing pressure to be tougher on Pyongyang. On Monday, Mr Moon ordered military reforms to enhance the country's defence capability, saying that South Korea must be able to swiftly adopt an offensive stance if the North attacks it. South Korean Defence Minister Song Young Moo is set to meet his American counterpart James Mattis in Washington this week to discuss countermeasures against the North's growing missile threats. But analysts said that Mr Moon is unlikely to deviate much from his long-term goal of improving ties with the North. At a ceremony yesterday to appoint the new vice-chairman of the National Unification Advisory Council, the South Korean leader reiterated his goal. "We must work harder to bring about change in inter-Korea relations," he was cited as saying in a presidential statement. Unification Minister Cho Myoung Gyon said yesterday at a forum that South Korea will persist in diplomatic efforts to peacefully resolve the North's nuclear issue, while sternly responding to its provocations at the same time. Opposition parties, however, continued to urge Mr Moon to give up his dreams of reconciliation. The main opposition, the conservative Liberty Korea Party, asked him to re-calibrate his North Korea policy and not hang on to the "illusion" that Pyongyang would end its nuclear programme if talks resume. The minor Bareun Party also called on the Moon administration to stop being "preoccupied" with its so-called Berlin initiative to seek talks with the North, and take steps to boost the country's missile defence against Pyongyang's threats. Dr Go Myong Hyun of The Asan Institute for Policy Studies told The Straits Times that Mr Moon gave a strong response yesterday for two reasons - to ease domestic pressure and remind North Korean leader Kim Jong Un that he would reach a dead end if he continues to launch provocations. "With (yesterday's) strong response, the South Korean government sends a message that South Korea is going to match North Korea's escalations," he said. "It shows... this government is not a friendly government to North Korea."